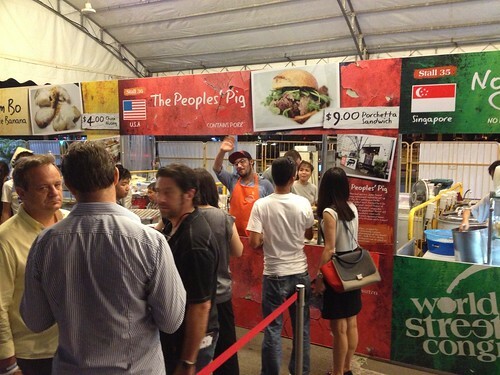 The World Street Food Congress took place the past ten days in Singapore and Portland made a great showing. From the first night to the last, residents of Singapore and beyond enjoyed porchetta from The People’s Pig, shrimp and grits or smothered chicken from The Swamp Shack or a crab sandwich from Euro Trash. All three vendors, along with 35 others have worked 12 hour days to make this happen. Having been at the street food jamboree every day for the past 10, I’m not being glib by saying the Portland vendors had some of the longest lines. Well done. 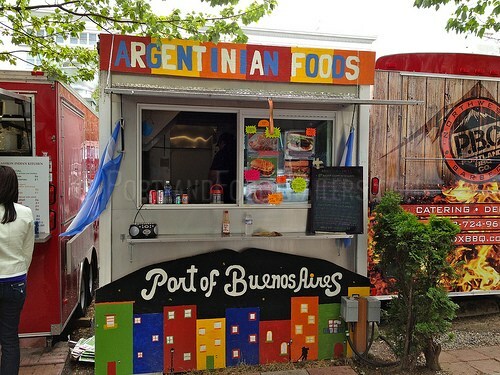 Located at the F1 Pit Building, the organizers of the event set up small kitchens for each of the forty vendors equipping them with everything from rice steamers to open charcoal grills to deep fryers and convection ovens. Some were simple, like the Vietnamese Nam Bo which used charcoal to grill glutenous rice wrapped bananas in banana leaves – an amazing dessert dish to rival any I’ve ever had. Charles Thomas of Euro Trash took on the challenge of frying his beer battered soft-shell crab in traditional Vietnamese woks. Chef Vo Quoc of Vietnam spent a few hours with Charles to show him how it is done. I think we may see a wok at Euro Trash in the future. Cliff Allen of the People’s Pig shared his special relationship with pork belly with fellow fans. Trey Corkern of The Swamp Shack brought grits to the island, a dish very few had tasted but now love. Heaven’s Indian Curry, a Singaporean vendor with Indian cuisine used hand forged cast iron bowls atop coals to create Appam, a thin pancake served with egg and sugar. Each and every vendor offered something unique from their home country. Some traveled hours just to get to an airport to come to Singapore – their first trip on an airplane. True street food vendors. Singapore knows street food, yet what’s different here is they have taken the unique cuisines from around the world off the street. In an effort to regulate and ensure proper hygiene, the government created Hawker Centers throughout the city and relocated the vendors inside. These centers offer covered seating, fish, meat and fresh vegetables and fruit markets and a variety of 8′x8′ stalls selling everything from pig organ soup to sate to duck rice and more. Chinese, Malay, Indonesian, Vietnamese are just some of the options. Want a large plate of slipper crab tails? Got’ em. And they are only $10. Each hawker center has at least 40 different vendors. This is Singapore’s street food and we all explored as many as we could. My favorite? Sambal Sotong, a spicy squid dish. The two day congress featured speakers from around the world – Anthony Bourdain; James Osland of Saveur Magazine; KF Seetoh, the organizer of the event; Chef Bryant Ng from The Spice Table in LA; Chef Claus Meyer from Denmark’s Noma restaurant and William Wongso, the master of 1000 sates from Indonesia. Each speaker brought a different perspective on how street food is changing in the 21st century. In Vietnam for example, it is illegal to be a hawker. Vo Quoc, a well known TV personality and chef has set up a program to teach orphans and youth culinary skills. He then captures and promotes family recipes that are being lost with every generation. Many discussions and conversations were about just that – the possible loss of dishes and flavors with the shift either to corporate cuisine or simply having the family patriarch/matriarch pass without teaching new generations. I spoke about how in Portland and America, we are experiencing a renaissance in street food culture with the growth of food carts in Portland and the proliferation of food trucks throughout America. Everyone was fascinated about how Portland’s pod culture grew and evolved over the last 30 years and some want to replicate it. I’m full. I eaten amazing food for 10 days and I still have a final day here to explore. I’m proud to have been a part of this event and am in awe of what chefs can create in small spaces with the ingredients they are provided. Street food is here to stay in the world and the conversation will continue. We met the owner of the first food truck in Moscow. Hopefully she’ll be back next year with fellow vendors. A wonderful week. A wonderful event. Amazing cuisine. The World Street Food Congress and Singapore’s hospitality will draw us back for sure.